You are currently browsing the tag archive for the ‘Dangerous Hunts – A Zombie Fathers Day Tale’ tag. “So, do you think , kiddo?” Though, judging by his son’s disgusted expression, Matthew probably already knew the answer. Originally posted over at Tastes Like Comics. Robby and his new father Matthew have a strained relationship that they attempt to endure for the woman in both of their lives Janet. Any bonding between the two comes as a struggle, so when Janet suggests Matthew take his new son on a hunting trip he reluctantly agrees, despite feeling the effort will be wasted. After all Robby prefers to play Grand Theft Auto than step outdoors. Before the two men in Janet’s life can come to an accord, the tour group suddenly finds itself under attack from a different kind of hunt – the undead. Masters sets the scene quite nicely and as is typical for zombie fiction, the mouldering monsters function more as a metaphorical plot device. In Dangerous Hunt the allegory is the nature of male bonding, how danger can bring them together. The comparison between video game violence and hunting parties is an interesting one, not one that has often been made. Perhaps because hunting is seen as outdoor exercise, whereas gaming is the province of pale-skinned competitive sorts who live on the internet. Instead, this story hints that there is a common root. I was reminded of David Eddings’s first book High Hunt, which came before his successful career as a fantasy author, as well as the film Southern Comfort which paralleled a hunting party in unfamiliar territory with the occupation of Vietnam. The men in Masters’ novel are unprepared for the devastating zombie assault, but quickly take to headshots and explosives. Being allowed to kill with impunity is shown to be enjoyable to some of the characters, especially the bloodthirsty Daniel, a fellow ‘tourist’ who takes to the combat quite naturally. As for zombie fans, the creatures here avoid the recent trend of identifying the undead as being the result of some experimental virus, or disease. Instead it is hinted that a naturally occuring plant on the island is responsible, more in keeping with original houdon tales of resurrected murderers. 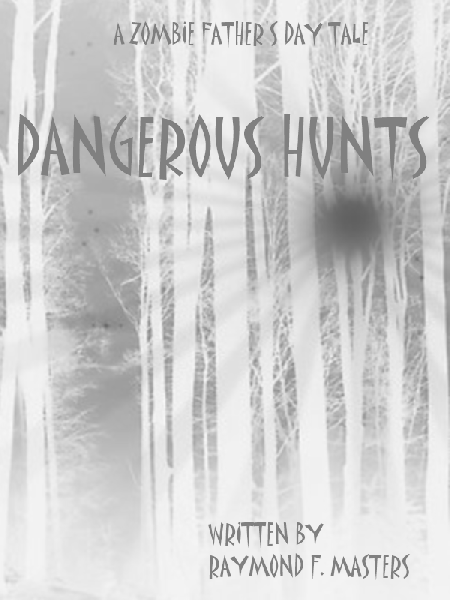 Overall Dangerous Hunts is an enjoyable and fast-moving short yarn, with an interesting use of the zombie sub-genre tropes. Go check it out.